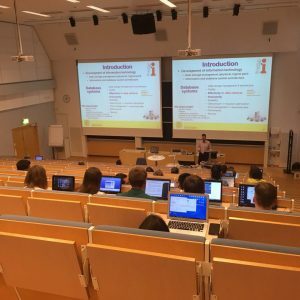 The 22nd Open Innovations Association FRUCT (Finnish-Russian University Cooperation in Telecommunications) took place in Jyvaskyla, Finland at Jyvaskyla University from 16 May 2018 till 18 May 2018. 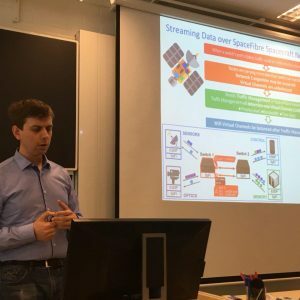 Associate professor of department #14 of aerospace computer and software systems, head of EmCoMobile laboratory Valentin Olenev, junior researcher Ilya Koborkov and engineer Lev Kurbanov participated this conference from IHPCNT side. 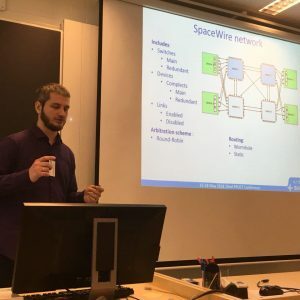 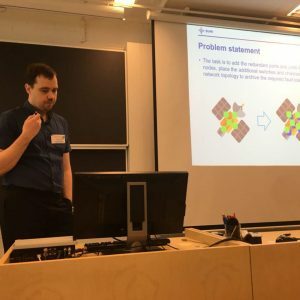 On the conference they presented the results of the implementation of design and simulation system for the SpaceWire networks and mechanisms for the increasing of network link bandwidth usage in SpaceFibre networks.